A collection of BBC programmes entitled ‘The Tudor Court Season’ begins on Thursday 23 May. Amongst the programmes is one about Thomas Cromwell presented by Professor Diarmaid MacCulloch which was partly filmed in St George’s; it will be shown on BBC 2 at 9pm on Friday 24 May. 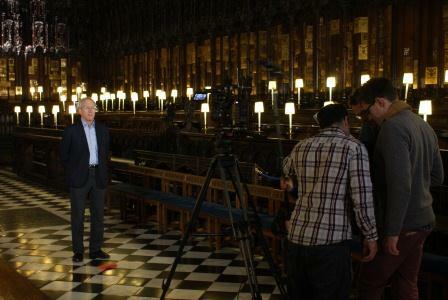 The photograph shows Professor MacCulloch and film crew in the Quire of St George’s Chapel.